Rep. Alexandria Ocasio-Cortez (D-NY) said on Monday that Congress should not give any money to “unstable” President Donald Trump for a border wall. 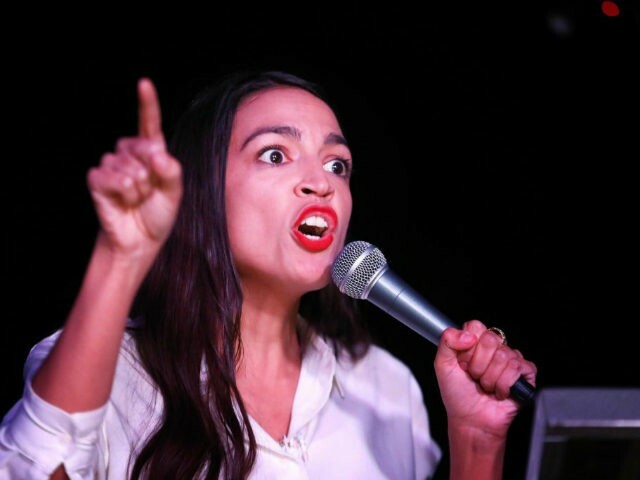 The freshman Democratic-Socialist Representative, who said Democrats do not have to compromise their values to find common ground with others, has previously called Trump a “racist” and the border wall a “racist” “monument to hate.” She also ran on a platform that included abolishing Immigration and Customs Enforcement (ICE). After Trump offered on Saturday to extend the work permits of Deferred Action for Childhood Arrivals (DACA) recipients and those with Temporary Protected Status (TPS) for three years in exchange for $5.7 billion for the construction of physical barriers along U.S.-Mexico border, other amnesty activists said “no way” to the deal. Former Rep. Luis Gutierrez, who is now a senior policy adviser for the National Partnership of New Americans (NPNA), which condemned Trump’s proposed deal, even compared Trump to Leonid Brezhnev. Who is she to call anyone unstable? She is nuts. She made a statement about people getting "ringworm" because they have no insurance. She does not even know what ringworm is! LOL...it is a fungus, like athlete's feet. It is in the soil or from cats, etc. Did she think it was intestinal parasites, like tapeworms? Not only can she tend bar...she is an expert medical advisor, Doctor and Brain Surgeon. Let's put her in charge of the Center for Disease Control...she needs a thorough exam! Oh...I forgot, she is a financial genius too! Boy, the Democrats certainly hit the jackpot, she can wear many hats! Or did they hit the "crackpot"...she is out of her mind! Judy, MW and GeorgiaPeach like this. Just heard Rush talking about her. He says the media is propping her up (which has seemed obvious to me) but they will turn on her eventually and knock her down. He says the media often does this with politicians however they didn't prop Trump up so they can't knock him down. GeorgiaPeach, Newmexican and MW like this. If we do not need a wall, ICE and border security...then why do we need the TSA? Just let anybody fly into the country as they wish, and let anybody on a plane as they wish, without the IMMORAL TSA and immoral airport security. If it is a global right to illegally migrate to any country you want and barge right in, is it also a global human right to fly into any country you want without security? Let's all head for Australia, Switzerland and New Zealand...see how they like this new policy. So in theory, anybody from any country, can get on a airplane, come here and demand asylum, bypass the IMMORAL security agents. After all, it is their human right. Eh Chuck and Nancy? Last edited by Beezer; 01-22-2019 at 02:57 PM. Wild eyed Bolshevik and anyone that takes her seriously is delusional IMO. Beezer, Judy and MW like this. Judy, Beezer and MW like this. LOL!! HA! HA! Hilarious! Love that one. I love good political cartoon humorists. They're the best! !